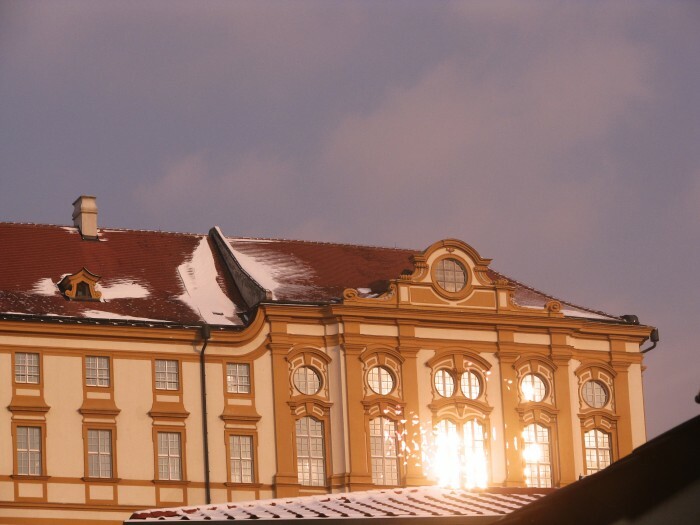 I took these photos of a castle in my country last winter. 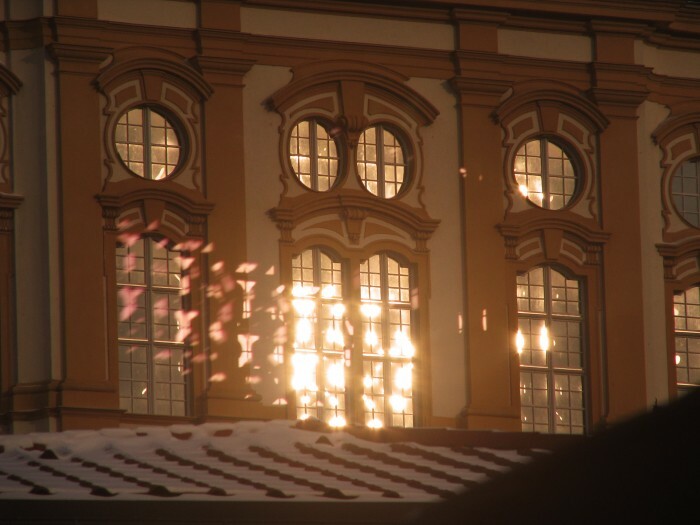 One day I noticed these strange reflections, it appears only during winter when there is snow, the sun creates reflections in some of the windows. The reflections look like purple butterflies made of light when you zoom in on them and it’s quite magical. My camera isn’t very good and neither am I at photography so credit goes to the sun and the architect. That is a special part of the castle not everyone has entry to by the way, I can only speculate what kind of magnificent light spectacle is going on in that room every winter when this happens. And nobody else knows about this, you’re the first to see it except for one person. Are these reflections visible only through the camera lens? These are pretty cool, but they do look like an artefact of the camera itself. The intense light from the reflection might be bouncing around between the glass parts, the same way you see multiple reflections of a light if you look through a double glazed window. The pink colour might have come from a dichroic filter, common in digital cameras. Yes this is definitely an example of ‘ghosting’ and is caused by the digital sensor in the camera. The sensor is much more reflective than film was in the days of film cameras and can cause the light to ‘bounce around’ inside the lens, creating multiple (ghost) images. You can tell this is ghosting because some of the window ‘reflections’ are on the stone. but still, “buttflies made of light” sounds prettier than ghosting. Aw man, you guys with your science. Haha no I’m grateful for the technical explanations, numb7ers and Zorro. But it doesn’t take away from how I fascinated I am with it. Also, I figured it had something to do with the camera but the thing is, these reflections would show up regularly at a specific time when the sun was bright enough. It wasn’t an accident that happened only once. Or maybe that comes as no surprise either, I don’t know. I’d like to know if you can cause this effect on purpose, if anyone knows. I know mate, this post is a pretty big give away though. I too miss talking to you dieA lady. Beautiful. 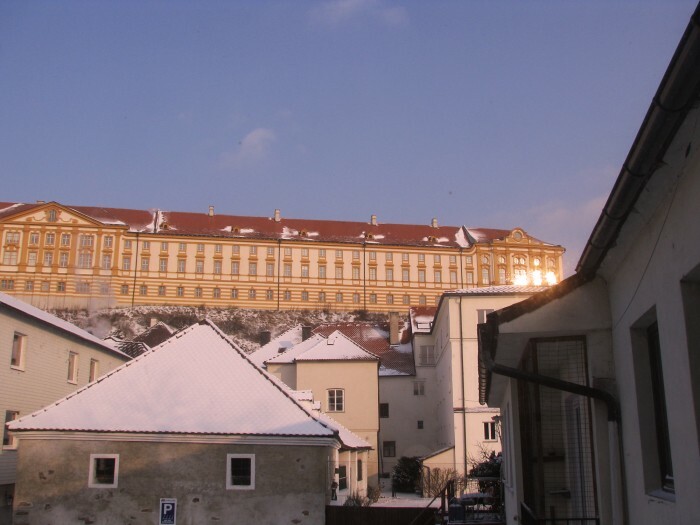 Looks like a more modern castle or royal palace from the 17 to 18th century. I bet it is even more amazing in the inside. Stop taking pictures of my house. Is this the Stift Melk? If so I’ve stayed there several times, and it gets a little scary at night sometime!! …to say the least!